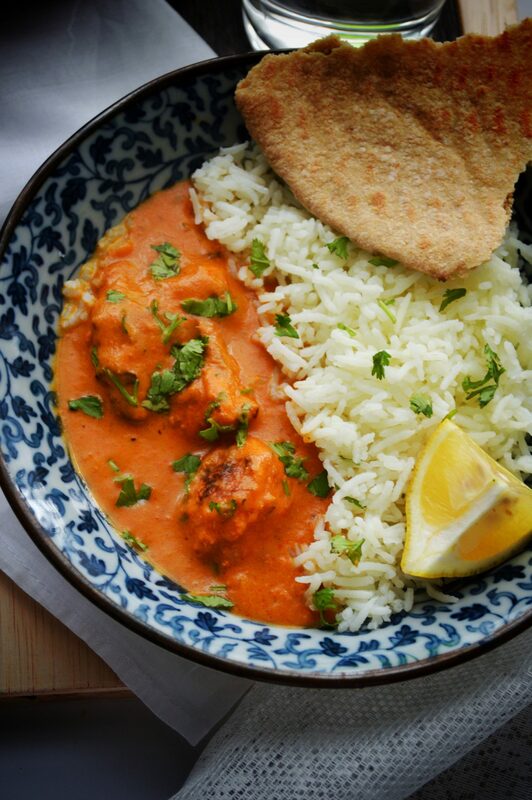 This rich, buttery, creamy curry needs no introduction. 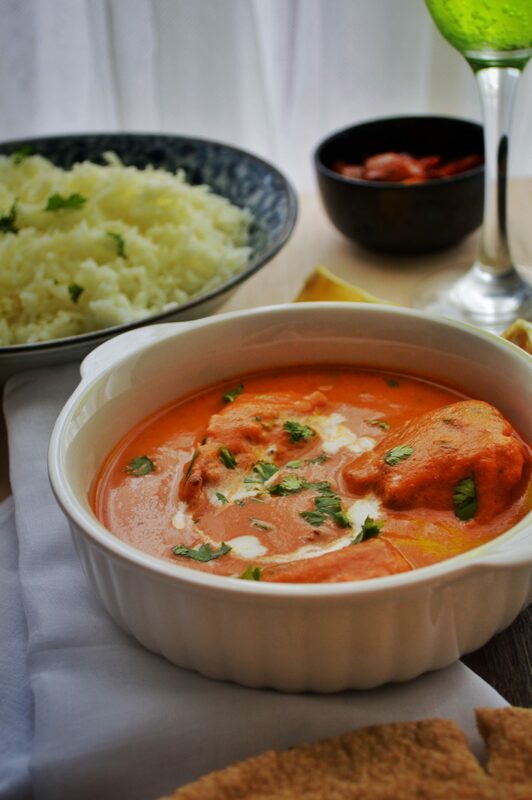 Butter chicken, without any doubt is one of the most well known and most loved dishes around the world. 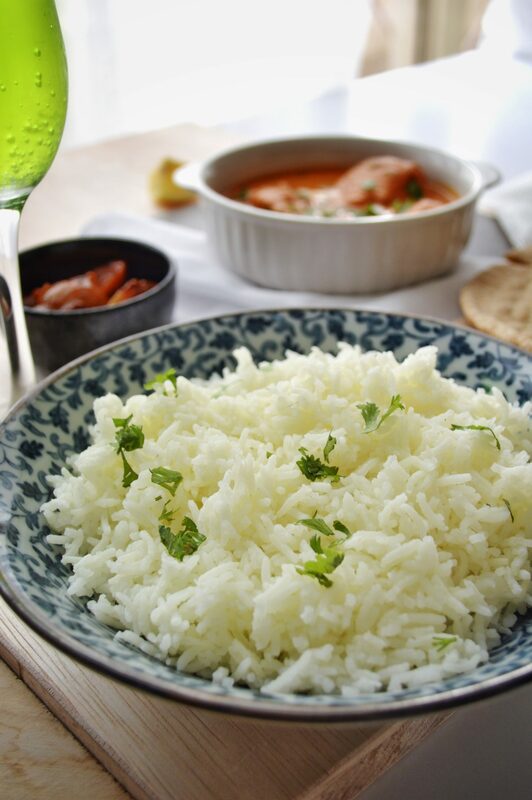 I came to know recently from chef Gordon Ramsay’s show, Gordon’s great escape that this dish has its background in Punjabi cuisine and was developed by Kundan Lal Gujral, owner of Moti Mahal restaurant situated in the capital city of India, New Delhi. 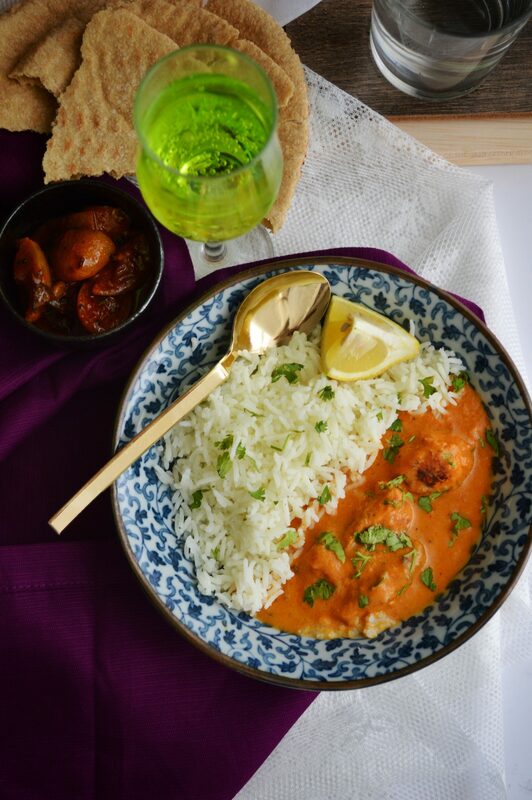 It seems this dish was originated to end the problem of excess chicken tikka, which if left overnight gets hard and fibrous. 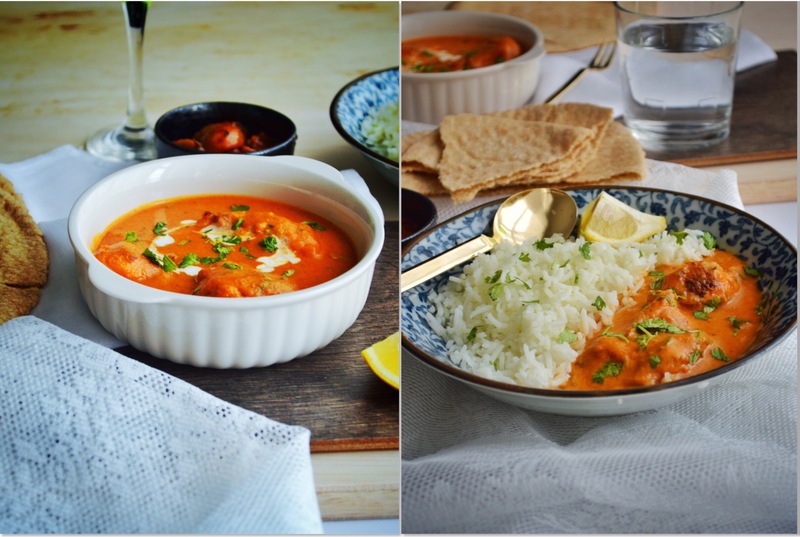 What a great idea to use up leftover tikka, i must say! 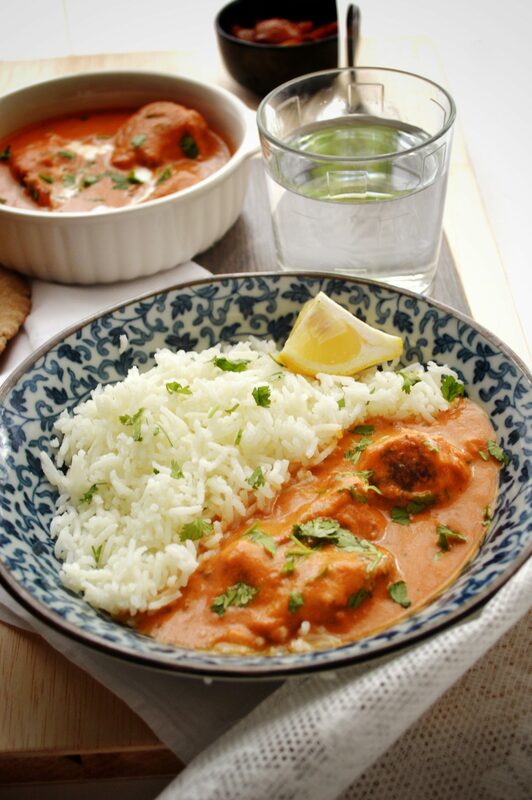 Butter chicken is a must in all Indian restaurants (mainly the north indian ones). 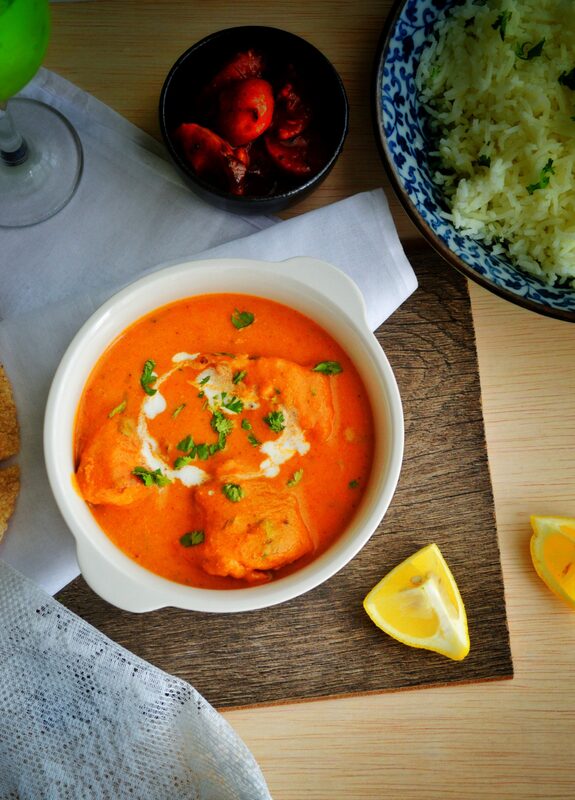 You can rate the quality of a restaurant by trying out their butter chicken. According to me, a restaurant is not worth going to the second time if they dont serve a good, satisfying plate of butter chicken. It is a fav among the kuwaitis here, but i actually dont get that satisfaction when i have it from restaurants here. I like to have mine spicy, creamy and flavorful with a sweetness that balances all the flavors. But here, they modify the recipe to satisfy the locals taste buds and makes it sugary sweet, less spicy and very bland. 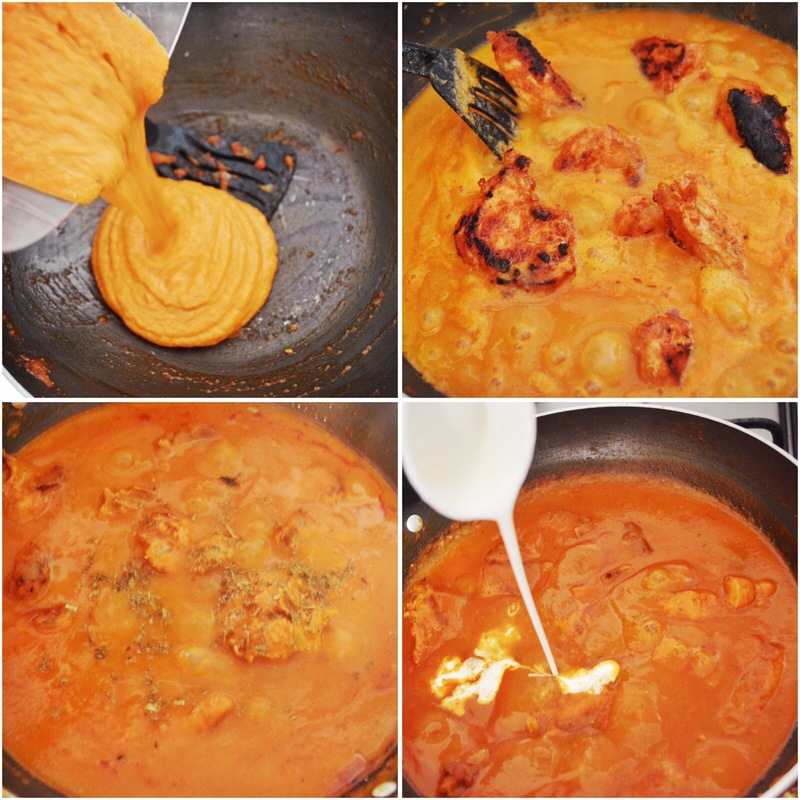 Butter chicken is made with pureed juicy tomatoes, and spices are cooked in butter and finished off with a rich cream. The aroma of the kasuri methi/dried fenugreek leaves is the highlight of the dish. The chicken is marinated in a yoghurt based marinade, grilled (i shallow fried it) and cooked further in the prepared gravy. 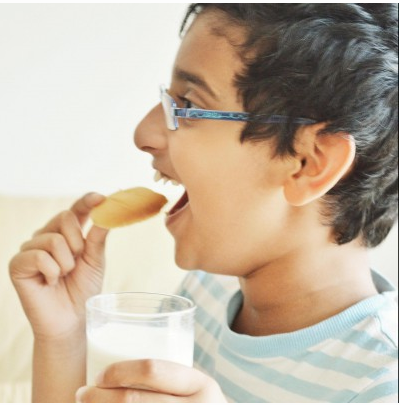 It goes very well with soft naan, ghee rice or even with biryani like how the hyderabadis have it. ✔️ Red food color can be added if you want. ✔️ You can adjust the thickness of the gravy by adding more or less water. 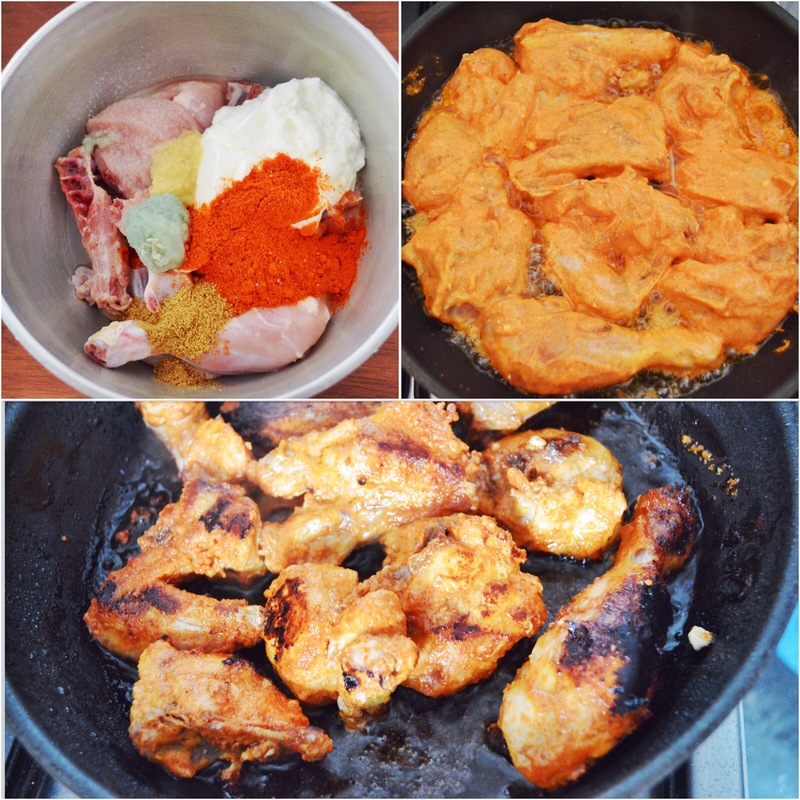 Marinate the chicken in above mentioned ingredients and leave for 15-20 minutes. Heat 2 tbsp oil in a frying pan and place the marinated chicken in a single layer and cook them on high flame till chicken is charred on all sides. Set this aside. In a heavy bottompan heat oil and butter and heat up. Add in zeera and let sizzle. Add onions and sauté till onion is well browned. Add in ginger garlic paste and sauté well. 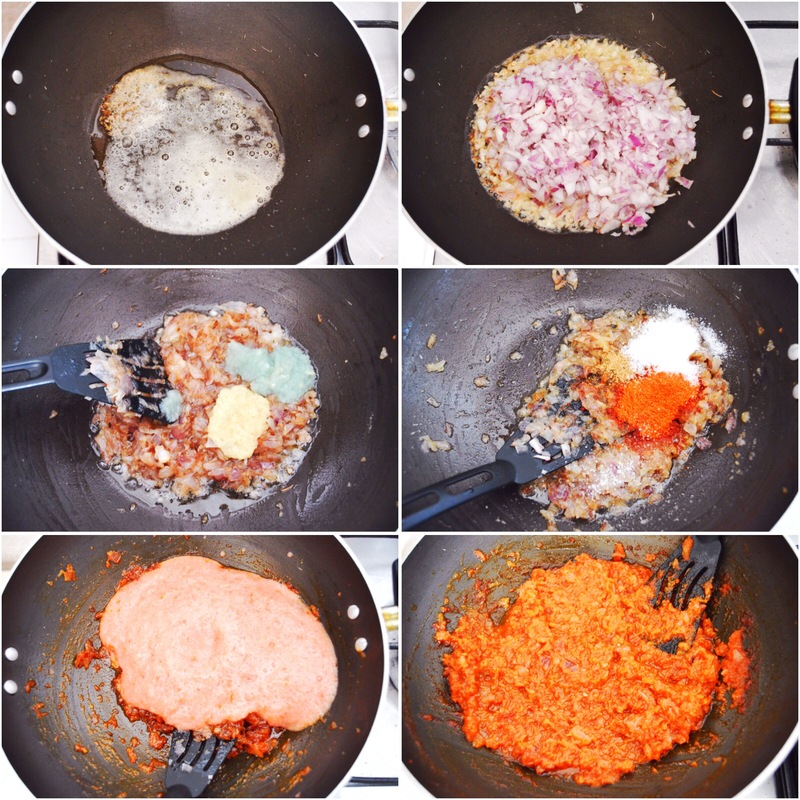 Add in the chilli pdr, garam masala pdr, salt and sugar and mix well and cook for 30 seconds. Pour in the tomato puree and mix well. Cover and cook for 8-10 mns till oil starts separating. Let the mixture cool and then blend this in a blender till smooth. Add in fried chicken pieces and cook in low heat till chicken gets cooked completely for about 15-20 mins. 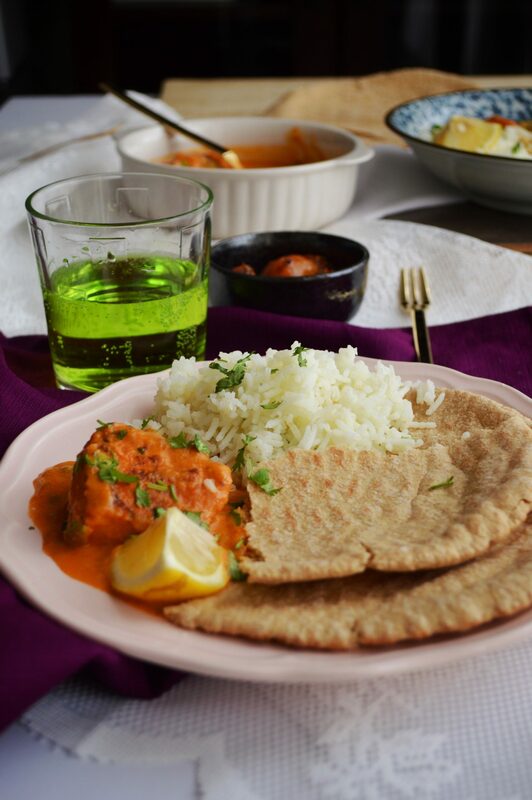 Once chicken is cooked, add the crushed kasuri methi. Pour in the cream. Simmer again for another 5 mins. Switch off the flame and add in coriander leaves. 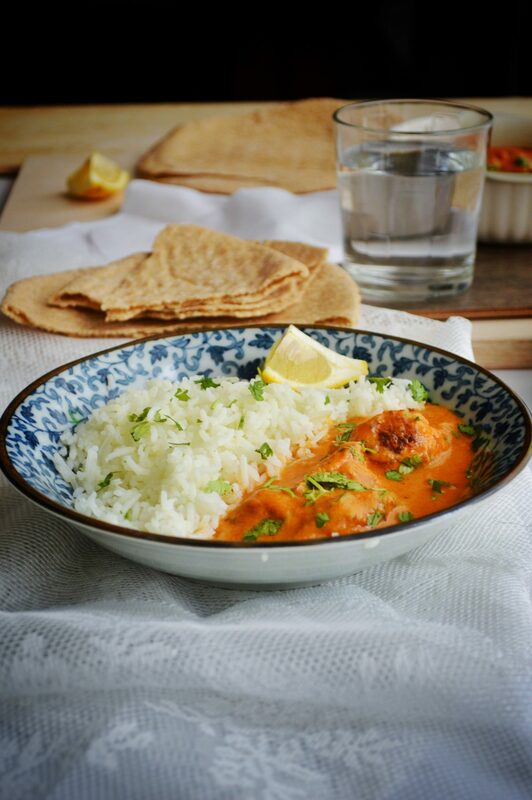 A rich, creamy and buttery chicken curry. * Red food color can be added if you want. * You can adjust the thickness of the gravy by adding more or less water. 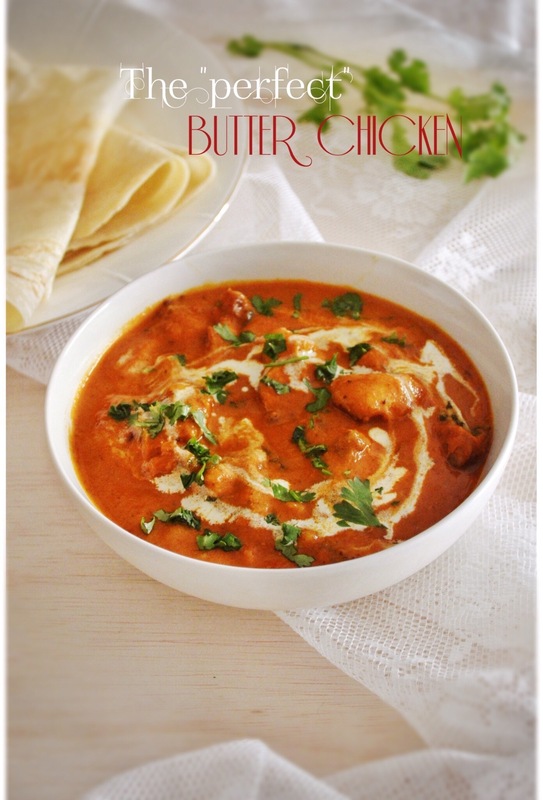 LOVE butter chicken! Those pics are drool-worthy. Looks amazing…like a piece of art! Love the colour and this lovely recipe! Will surely try this! How many tomatoes? ?was it boiled before taking the purée?! Its mentioned 2 tomatoes in the ingredients list dear. Nope i didn’t boil it, just blend in the blender. Soo sorry buraida fr the late reply. About the tomato puree, its there mentioned in the ingredients. I pureed it in the blender. 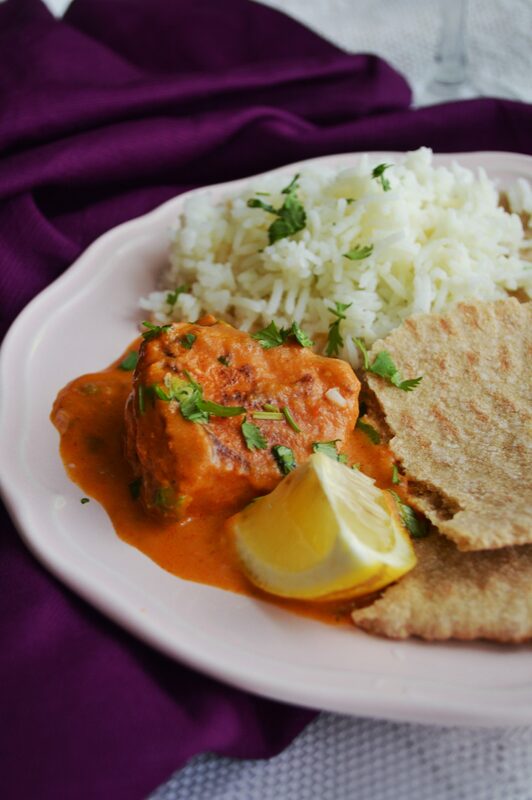 Sadia, I made your butter chicken this weekend, and my whole family absolutely loved it! It was so delicious. It was fun using spices I had never used before. It smelled so good while it was cooking. I know I will be making it again and again. Thank you so much for this yummy recipe! Hi Sadia, It’s me again! 🙂 I’m sorry to be such a pest. I have another question. I made your butter chicken again, and it came out completely different. I loved it both times, but this last time it looks more like your picture. The thing that was different about it was the amount of spiciness. It was very spicy this last time, and we enjoyed that even more. I think I know what I did. The first time I used regular chili powder that we have in the states here. The 2nd time when I went to the Asian food store, I saw red chili powder and since this is what the second half of your recipe calls for, I got some and used that instead in the gravy. My question is, what do you use? Do you use the red chili powder in the marinade and the gravy or just chili powder? I was just curious. It was wonderful. We love spicy foods! Thanks so much! Lovely recipe and Amazing pics as always. I have a doubt. Since we are blending the onion tomato mix after cooking. Can we use chopped tomatoes and then once the oil separates blend together. Will it make a difference. Just a suggestion dear. Yeah that would be fine Rini! Hey Hazel, Kasuri methi is dried fenugreek leaves.